Ho Yan (Alex) Leung graduated from the University of Auckland with a Bachelor of Engineering in Electrical and Electronic Engineering in 2009. He commenced a PhD in Biomedical Engineering at the Auckland Bioengineering Institute in 2010 under the supervison of Associate Professors David Budgett and Patrick Hu. His PhD project focused on the energy management and optimisation of Transcutaneous Energy Transfer (TET) systems for implantable heart pumps. Following the completion of his thesis at the end of 2013, Alex joined the ABI staff as a Research Fellow, developing systems to power implantable devices. Alex's research interests include Inductive Power Transfer (IPT) and analysing how power may be delivered into the body to supply power wirelessly to implantable devices. Implantable heart pumps such as a Left ventricular assist device (LVAD) is used in patients with stage 3 or 4 heart failure. They are commonly used as a bridge-to-transplant device or recently as a therapeutic device for patients in early stages of heart disease in hope to restore the functionality. However the main cause of adverse events for these patients is not pump malfunction, rather it is the chance of infection around the wound where a percutaneous driveline is used to provide power to the pump. This driveline is required since there is no implantable battery that can power these pumps, which can draw up to 10W of power and must run 24/7. Wireless power transfer (WPT) technology can transfer power transcutaneously through the skin, by using oscillating magnetic fields between two coils (implanted and external). Successful application of this technology can overcome the problem of driveline infections. Bench testing and animal trials have shown that our Transcutaneous energy transfer (TET) system can deliver 10W of stable power under varying coupling conditions. Currently we are trying to show that the heating of the power transfer coils (due to inefficiencies) does not cause a temperature rise of more than 2°C on the bodily tissue in contact with the coils. At the end of the animal studies we will be able to demonstrate a TET system capable of delivery up to 10W of power safely into the body, with temperature rises of less than 2°C on all bodily tissue and without the need of coil alignment mechanisms. Leung, H. Y. (2013). Wireless power for heart pumps: Control and energy measurement The University of Auckland. ResearchSpace@Auckland. Related URL. Leung, H. Y., Budgett, D. M., McCormick, D., & Hu, A. P. (2012). 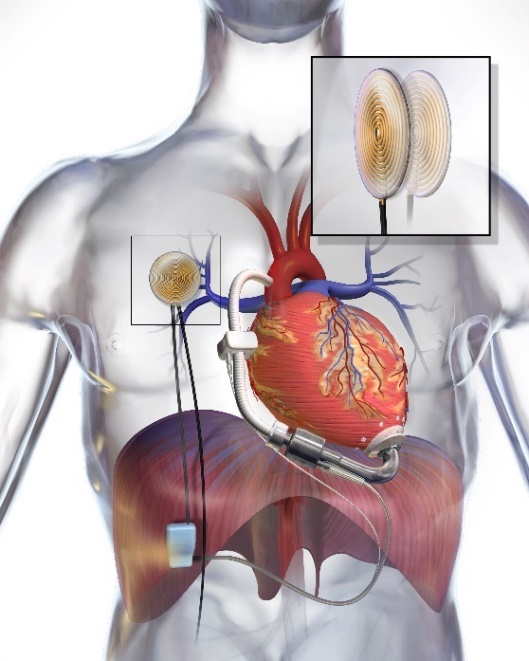 Wireless power system for implantable heart pumps based on energy injection control. Progress in Electromagnetics Research Symposium.